Here’s a different kind of chili –vegetarian chili with pumpkin. I was a bit skeptical of adding pumpkin puree to chili and omitting the beef but went ahead and gave it a try. And I was pleasantly surprised. The result is a dish which has the spices of traditional chili; full of vegetables and black beans which add texture and flavor. The pureed pumpkin thickened the chili but didn’t overpower it. autumn, ’tis the season for pumpkins and gourds. Pumpkins are quite nutritious, so in addition to carving and decorating, I’m trying to find ways to cook and eat them. 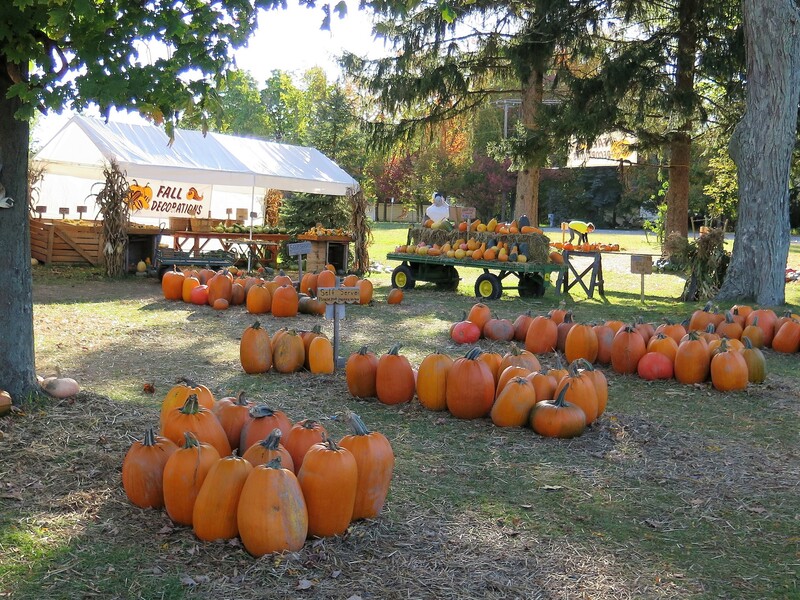 Last fall, on a visit to upstate New York, I learned where pumpkins must come from. Our trip took us along back roads where we drove by fields and fields of pumpkins. Of course, we stopped at a road side stand selling all kinds of pumpkins and gourds. When I purchased small sugar pumpkins for cooking this fall, I wondered if they came from area of the country. 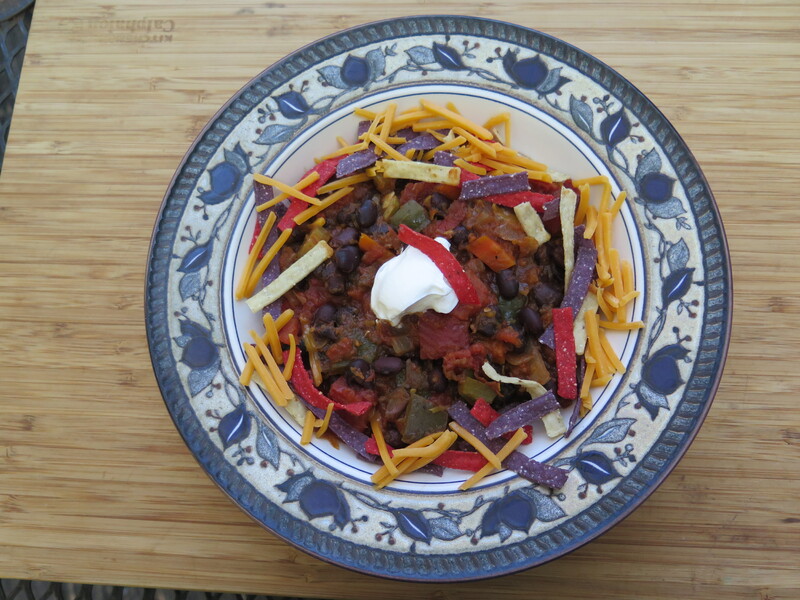 The chili that I cooked this week is a vegan recipe; the toppings contain some dairy products — they can be omitted for a truly vegan dish. 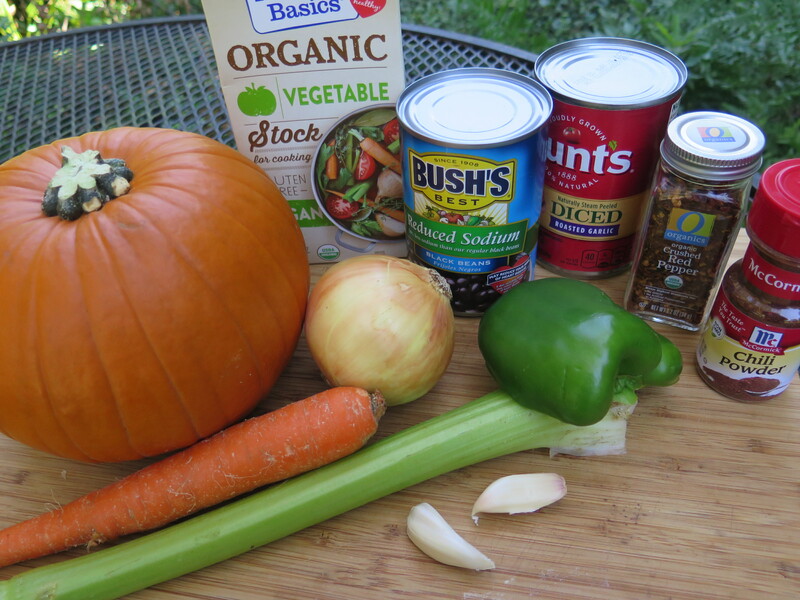 This chili is very healthy — low in fat and full of nutritional value from the pumpkin, carrots, onion and bell pepper. 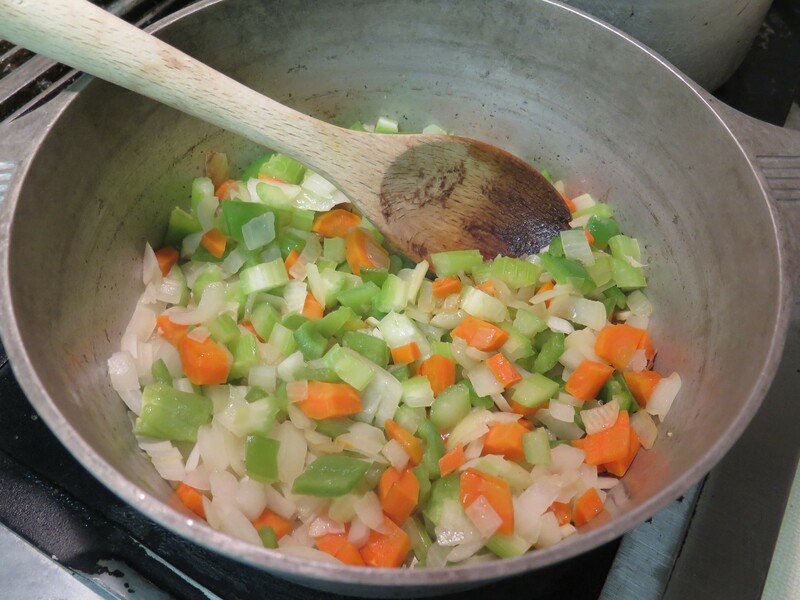 And the best part is that this dish is filling and tastes very good — all the vegetables blend well together. Pumpkin is often overlooked as a food which can be eaten — but it is much more that a fall decoration and a Halloween carving. Pumpkin is actually a winter squash, a member of the Cucurbita family which includes squash, melons and cucumbers. I’m finding many ways to eat cooked pumpkin in addition to making pumpkin pie. Pumpkin is very rich in nutritional value, high in fiber and low in calories. Pumpkin contains lots of Vitamin C and beta-carotene and the anti-oxidants– lutein and zeaxanthin — all important for immune function. Beta-carotene is converted in the body to Vitamin A and helps with eye sight and healthy skin. So eating freshly cooked pumpkin, when it is in season, is a part of a healthy diet. 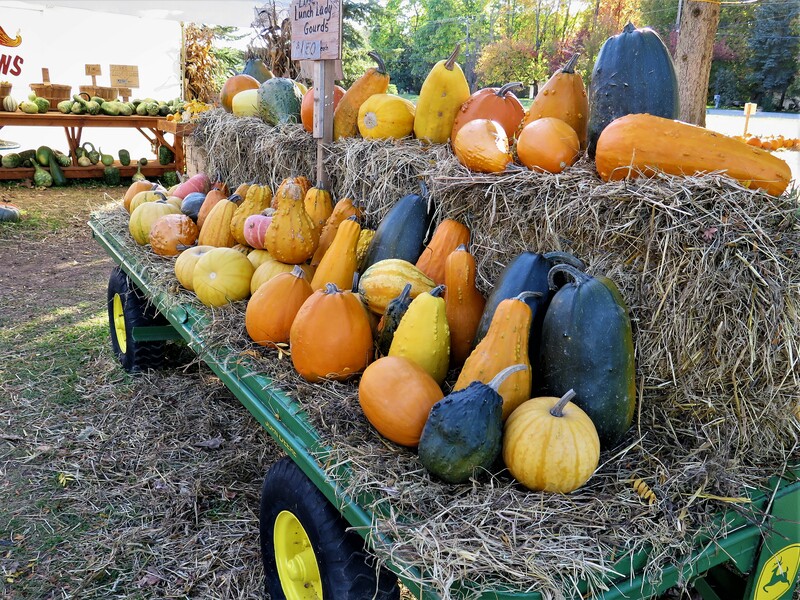 The best pumpkins for cooking small, sugar pumpkins which are more flavorful and less stringy than the large pumpkins for carving. This one is about 2-1/2 lb. 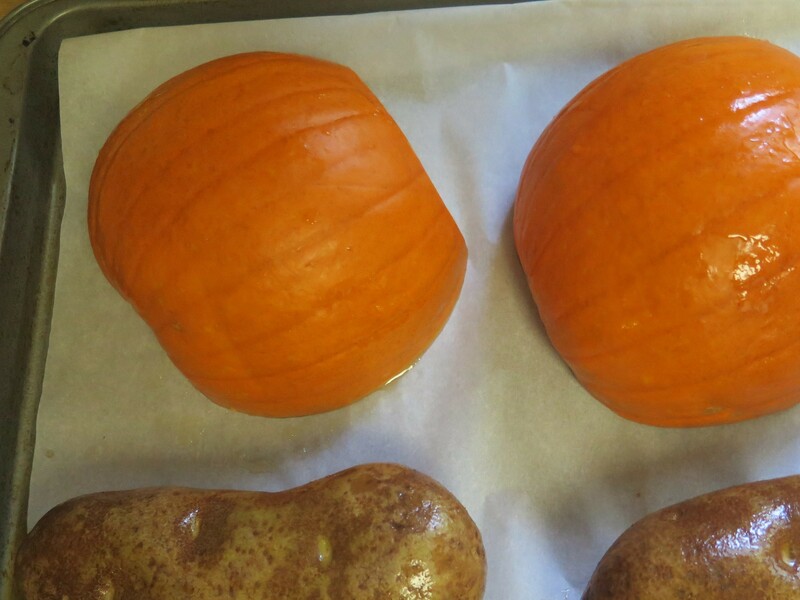 I cut the pumpkin in half, coated with just a little oil and baked in the oven at 350 degrees — here I’ve added baking potatoes. Making this chili is pretty easy and straightforward. I added all the raw vegetables to the pot at the same time with the onions and sauteed them together just until the onions became translucent — about 5 minutes. This resulted in a rather unique chili — the vegetables were cooked just enough to soften them — they retained their crunch and texture. And so I ended up with a crunchy chili — which I liked. 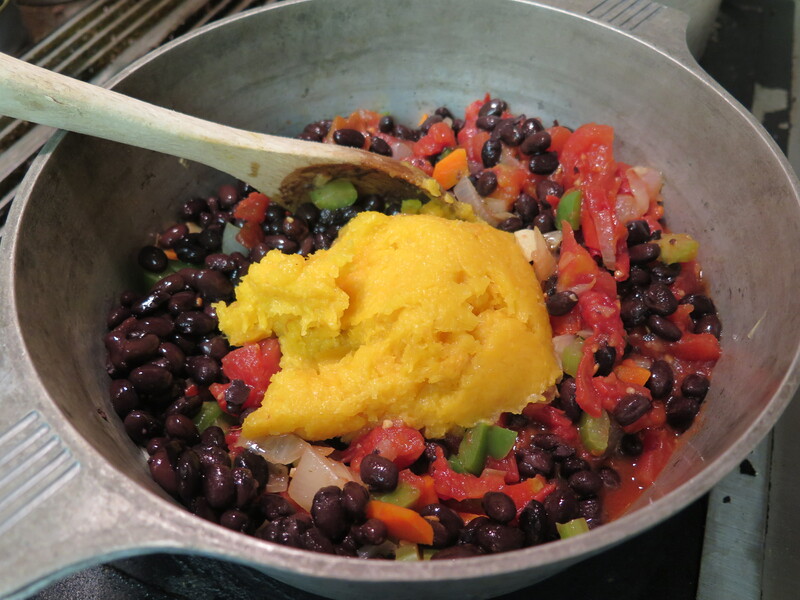 Then I added the diced tomatoes, drained and rinsed black beans, pumpkin puree and vegetable stock. The seasoning for this chili is simply chili powder and crushed red pepper — I didn’t want the seasonings to overpower the flavors of the pumpkin or vegetables. I let all this simmer for an hour or so to blend the flavors and let the vegetables cook a little longer. When ready to eat, I served with toppings which we like — tortilla chips, cheese, sour cream. It’s still a vegetarian dish (just not vegan). A filling and tasty meal — and very healthy, too. Add oil to large heavy pot or Dutch oven, and heat to medium high. Add the onion, carrots, celery, bell pepper and garlic clove and saute for 5 minutes until the onion becomes translucent. The other vegetables will still be somewhat hard. Add the chili powder and crushed red pepper and stir to combine. 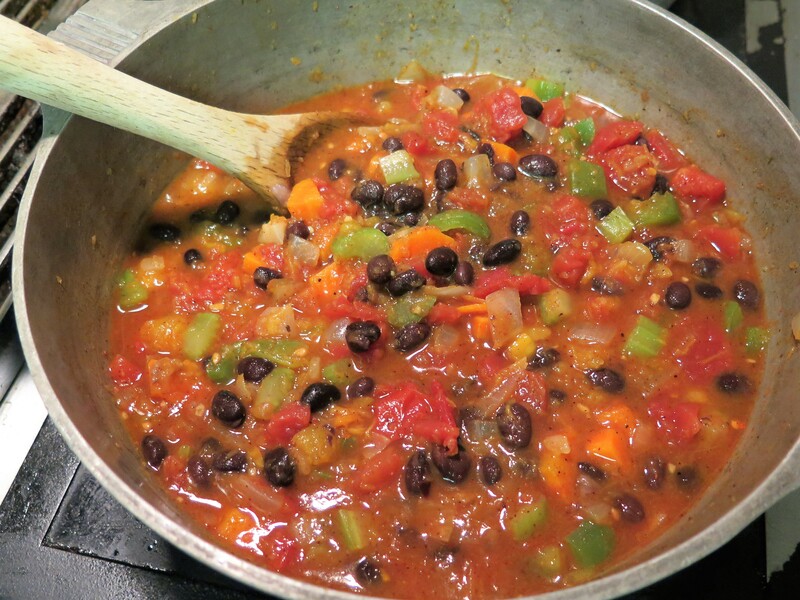 Add pureed pumpkin pulp, canned diced tomatoes with juice, drained and rinsed black beans and vegetable stock. Bring to a boil, stirring occasionally. Then reduce heat to low, cover and simmer one hour. To serve, ladle into soup bowls, pass sour cream, shredded cheddar cheese and tortilla chips. 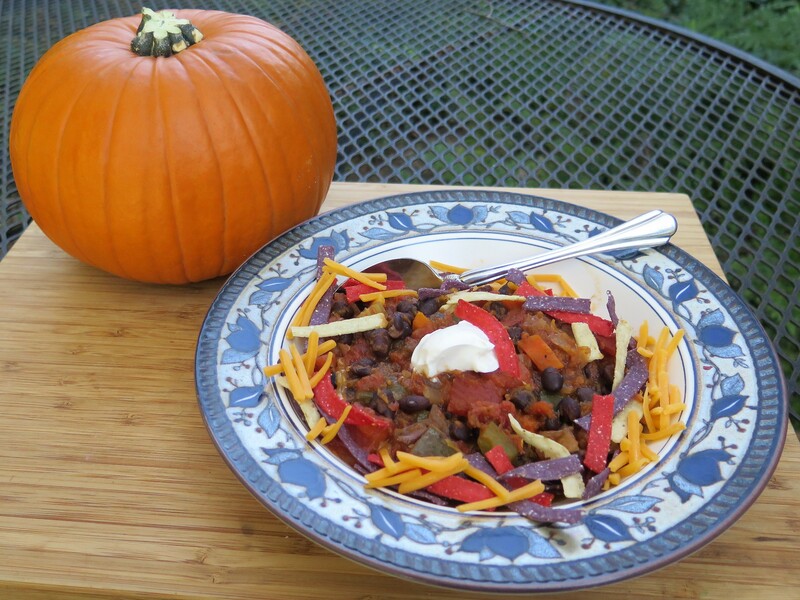 This entry was posted in Recipes and tagged chili, Pumpkin, vegan, vegetarian by Maylee at Beyond Gumbo. Bookmark the permalink.